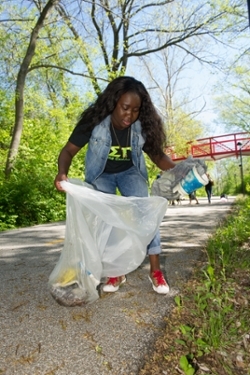 Southern Illinois University Edwardsville students from Eta Sigma Gamma (ESG), the community health education student organization, celebrated Earth Day by collecting trash and debris from the SIUE bike trails. The students emphasized that SIUE is their home and were eager to contribute to its cleanliness. 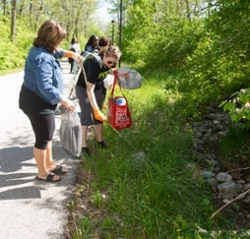 Photos: ESG member Love Adantor helps beautify campus on Earth Day. Members of ESG clean up along the SIUE bike trail.